Takehiko Inoue's Slam Dunk have released official uniforms for the popular basketball manga and anime series. Jerseys from 12 different characters are available online and the three main characters: Hanamichi Sakuragi (Shohoku High School), Shinichi Maki (Kainan) and Akira Sendoh (Ryonan), are included in DVD box sets. If you have the DVDs pick up the jerseys online via Rinkya Stores via Toei Animation for 10,290 yen a piece. Deadline for orders are August 31 for the first batch and October 31 for the second batch. I've always been a fan of Slam Dunk, especially Sakuragi. I love the character of this anime character. 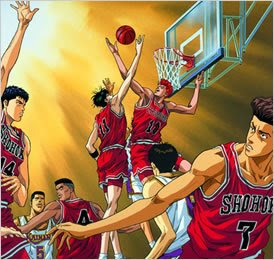 Just right after working on my term paper, I always make a time for watching Slam dunk.